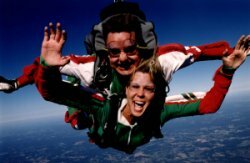 The Tandem Jump is a training skydive where you will experience all aspects of skydiving with little training or time required. You will jump with a parachute harness that attaches to your instructor's harness. It is similar to taking flying lessons, as the instructor is along to give you hands-on experience before solo. Our instructors average well over 1,000 jumps and have completed certification courses in the use of the Tandem Parachute System. 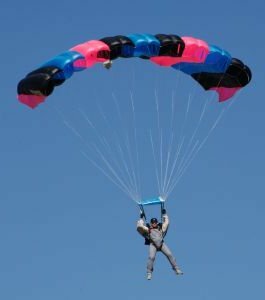 You may make a Tandem Jump by calling West Tennessee Skydiving at 901-SKY-DIVE (901-759-3483)and scheduling an appointment, which are available every weekend and on some weekdays. The training and jump can be completed in as little as 2 hours but you should budget about 4 hours at the dropzone to allow for inclement weather and other delays. Upon arriving at the DZ and checking in, you will watch a 20 minute videotape briefing followed by a 20 minute training session with your tandem instructor. You will be informed about the main and reserve high performance "square" gliding parachutes, briefed on free-fall procedures, and practice exits from the aircraft. You and your instructor will then board the aircraft for the ride to the jump altitude. Just prior to exit, you will move in front of the instructor and your harness will be attached to his at four points (two at the shoulder and two at the waist). You will exit and freefall face to earth with your instructor attached behind you (in tandem). After a freefall time of approximately one minute, in which you will reach a speed of 120 mph, the instructor will open the main parachute at 4,000 ft. With our Super King Air, the jump altitude is 14,500 ft. with a 60 second freefall and with our Super Cessna 195, the jump altitude is 13,000' ft. for a 50 second freefall. After opening, you will have a 5 minute canopy ride to the ground during which your instructor will be giving you hands-on experience in steering with the dual on the parachute. The "square" canopy lands much like an aircraft in that it is flared (slowed down) for a soft landing. We will provide a jumpsuit and goggles for your jump. After landing, your tandem master will debrief you on the jump, answer any questions and present you with a certificate as proof of your accomplishment. For an additional fee our freefall cameraman will video and take still pictures of the entire experience. You will be filmed on the ground, in the aircraft, in freefall and coming in to land including your comments about the jump. The video will be edited with music and given to you before you leave. To make a Tandem Jump you must weigh no more than 225 lbs and be a least 18 years old. After completion of the tandem jump you will have been exposed to all aspects of skydiving and you can make an intelligent decision whether to take the next step in the training process, the Accelerated Freefall Program ("AFF"). To participate in the "AFF" jumps, you must be at least 18 years old. To make your Tandem Jump, wear casual clothes suitable for outdoor activity at the temperatures forecasted for that day. For the warm months, shorts or jeans, a lightweight shirt, and tennis shoes are fine. In the winter we jump in temperatures as low as the mid 30's on the ground so bring a sweatshirt or long -sleeve shirt, jeans, a non-bulky jacket, lightweight gloves (without hooks), and sneakers. We encourage you to bring your friends, cameras, picnic lunches, chairs, and swim suits. Children are welcome if they are supervised by another individual in your party while you are making your jumps. The swimming pool is available for all our customers and their families during the summer months.